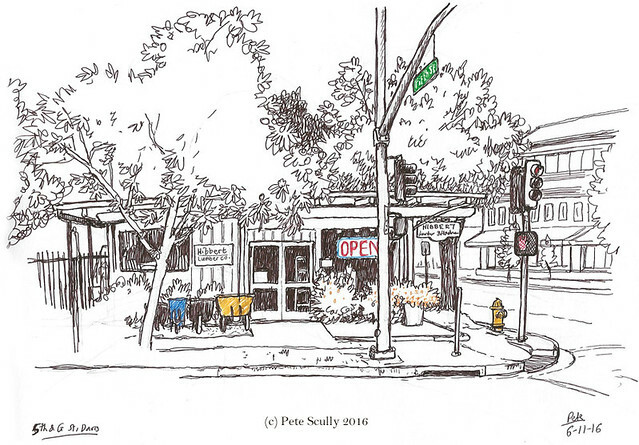 One Saturday afternoon recently I went into downtown Davis to do some sketching because there’s a bit I missed when I spent a decade sketching every inch of this town. I’ve never sketched Hibbert Lumber – I used to catch the bus across the street from here most days, the P bus back to South Davis. I live in North Davis now, it’s like a different country. There are no buses to where I live on a weekend, you have to walk or ride a bike (or drive if you are that way inclined). Well there is the P but it takes ages and totally goes around the houses and stops a couple of blocks away. Sorry, you don’t care about the Davis bus system. By the way that is run by Unitrans, on the UC Davsi campus, and they do a good job, even having some old London buses (pre-Routemaster even) which, yeah, sorry they are actually very uncomfortable to ride. I prefer the newer buses. At least they aren’t Boris buses. Perhaps one day the Boris buses will also end up out here in Davis. I wish we had gotten the Bendy buses, I actually loved those. Remember those, Londoners with short memories? Even though cities across the world (including San Francisco) have used them for decades in narrow city streets, London decided that after a few years of having Bendy buses that they just couldn’t have them any more, because the Evening Standard and Boris Johnson said they were the most pressing important thing for London to deal with. Boris Johnson yes, he has a tendency towards such political tactics to get himself what he wants (by the way, try not to give him what he wants today, Britain, or you’ll end up on a course which ends with him as Prime Monster. #VoteRemain). Yes I loved the Bendy bus, with its greater accessibility than double-deckers, so if there are any going spare and Davis can have them, let’s do it. I did spend a fun afternoon on one once though at New Oxford Street, the bus wasn’t even trying to navigate a corner, just get around some traffic, and it got totally stuck, like a boy with his head in the railings. The driver just got completely stuck in a Gordian knot of traffic and bus. I think in the end they got someone from Bletchley Park to come and unscramble the mess, it was quite the kerfuffle. Hibbert Lumber is an old established Davis business, family run, located on the corner of 5th Street and G Street. They were founded in 1947 down on 3rd Street and in addition to the lumber yard they are a hardware store. I stood on a hot afternoon sketching from across the street. I went for the simplified colouring option, because I had to go home and pack my bag for a week-long vacation in San Diego – much needed, let me tell you. So Hibberts Lumber, another Davis spot sketched. Next! Terrific sketch as always. I’m sure there aren’t many independent businesses still in operation from the 1940s so it’s great that you were able to record this one. I too like bendy buses. Where I grew up, we also had buzz buses which were wee stubby buses that you could flag down even if you weren’t near a stop. They only went on very specific routes but they were especially handy for the elderly or those with mobility issues to get them to the town centre and back. You’ve made me realize that I’ve not been on a bus since I emigrated to America 2.5 years ago. Yeah, they have those in the more remote residential parts of London (the hail-and-ride buses I think they are called), tiny little things, useful but they do take a long time to get to the destination! I remember first coming to the US and getting a bus from here to Sacramento, and one of my colleagues was very impressed, and asked about all the ‘characters’ that would have been on the bus, did I see anyone ‘interesting’ or ‘weird’, which I thought was the most bizarre thing to say. Er, just other people on the bus? One guy did press the bell and then decide to get off at a different stop, does that count? I guess some Americans think bus users are highly unusual people, that was an odd comment to me. I have been on buses in America – just not since we actually moved here – and have never once encountered any strange or weird behaviour. Now the underground is a whole other thing. I actually avoid using the New York metro at all costs when we visit NYC because I have had weirdo encounters every single time I have used it. Maybe I am just a weirdo magnet. I have used the DC metro more extensively and found it was generally fine until late at night. After commuter hours I was almost guaranteed some sort of bizarre experience. You may be right about stereotypes. I actually often get comments about walking everywhere. A couple of months after I first emigrated, one of the mothers at the preschool commented that she thought I was odd because “only hobos walk”. All I could do was laugh. What other way could I respond? And people I know pull over to ask if I need a lift. I just want to walk, people! Yeah, I’ve had that when out walking too. Once I was out sketching and a car stopped and they asked if I needed help, needed a lift somewhere. Nice people, just a concerned couple, they thought my bike had broken down, and I was a good three blocks from civilization. Just people being nice like that was a culture shock to me at the time, coming from London where people don’t generally do that. It’s what I like about America. Cheers! I appreciate your kind comment.